Martin Shortt Auctioneers have a proven track record for successful sales, thanks to their highly qualified team of experts and their strong knowledge of the property market in the Leinster and Ulster area. Martin Shortt Eastern and Midlands Holdings Ltd offers clients a wide range of services, where you will receive a friendly, efficient and professional service for all your needs. This is how Martin Shortt have grown their business over the past 25 years. 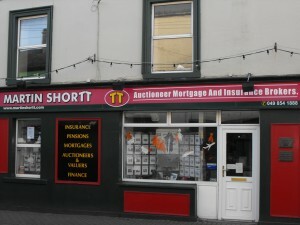 Martin Shortt services include: Auctioneer and Valuer, Finance and Mortgage Advice, Life Assurance, Health, Pension and Investment Advice, Commissioner for Oaths, Valuers, Financial Health Checks and General Insurance.